Henry VIII continued to try to produce a male heir. 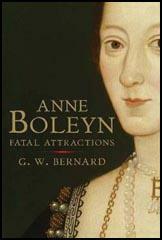 Anne Boleyn had two miscarriages and was pregnant again when she discovered Jane Seymour sitting on her husband's lap. Anne "burst into furious denunciation; the rage brought on a premature labour and was delivered of a dead boy" in late January or early February, 1536. (6) What is more, the baby was badly deformed. (7) This was a serious matter because in Tudor times Christians believed that a deformed child was God's way of punishing parents for committing serious sins. Henry VIII feared that people might think that the Pope Clement VII was right when he claimed that God was angry because Henry had divorced Catherine and married Anne. In April 1536, a Flemish musician in Anne's service named Mark Smeaton was arrested and interrogated at the house of Cromwell. He eventually broke down and confessed to having a sexual relationship with Anne Boleyn. David Loades has suggested that the story was "certainly fictitious, and probably a fantasy produced by psychological pressure". (10) Peter Ackroyd, the author of Tudors (2012) believes that Smeaton was tortured on the rack. (11) Another source said he was "grievously racked for almost four hours". (12) Cromwell now had the evidence he needed. It seems that Smeaton had told him that Francis Weston had been Anne Boleyn's lover. On Friday, 12 May, the Duke of Norfolk, as High Steward of England, presided over the trial of Norris, Weston, Brereton and Smeaton at Westminster Hall. The Queen and Lord Rochford would be tried separately by their peers, a privilege reserved for the aristocracy only; their trials were set for the following Monday. The accused men were brought by river to Westminster. Few details survive of the proceedings. Witnesses were called, and one member of the jury, Sir John Spelman, related that some were ladies of the court who testified to such promiscuity on the part of the Queen that it was said in court that there was "never such a whore in the realm". One witness repeated the words of a deceased Lady Wingfield, which was hearsay. At the end of it all, the jury returned a verdict of guilty, and the four men were condemned by Lord Chancellor Audley to be drawn, hanged, castrated and quartered. Chapuys says that Brereton was "condemned on a presumption, not by proof or valid confession, and without any witnesses". Most courtiers reacted to the verdict with sorrow, especially on behalf of Norris and Weston, both popular and respected men. Weston's family made frantic attempts to save his life, and on 13 May it was rumoured that he might escape the death sentence. But Lord Hussey, writing to Lord Lisle on 12 May, was of the opinion that all would suffer death, even the Queen and Rochford; Anne, he said, deserved it, for her crimes had been "so abominable" that he prayed God would give her grace to repent. On 12 May he and three others were brought to trial in Westminster Hall, where it was claimed that Anne had given money to Weston and the others accused, as she had done to many of the commonly penurious young courtiers, gifts which were now interpreted as tokens of a treasonable contract. Weston pleaded not guilty both to treason and to charges of adultery with Anne at Whitehall and Greenwich in May and June 1534. But despite efforts to save him by his family and by the French ambassador, Jean de Dinteville, he was condemned to death. The sentence of hanging, drawing, and quartering at Tyburn was commuted by royal mercy to beheading on Tower Hill.